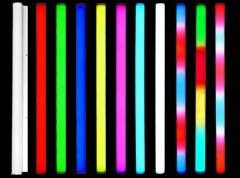 Imagine being able to change color, create patterns and move them along a tube. Now you can with the aptly named DYNAMO. 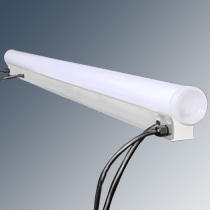 Instead of neon or fluorescent, an array of LEDs fills each tube. It looks like neon or fiber optics, yet it does much more. The DYNAMO instantly comes to life with flowing, ebbing streams of colored light. Custom patterns run automatically or are triggered from existing control systems. Visual effects that were previously impossible are now simple to create and control. 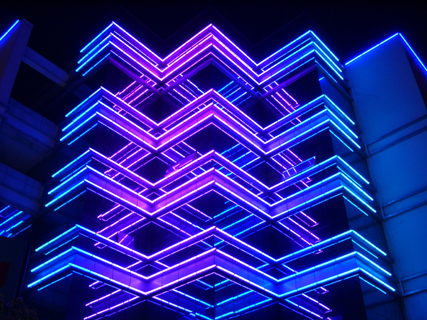 Each section contains individually controllable pixels comprised of red, green, and blue LEDs. Pixels can be uniform for a solid color effect or different to create color patterns. Color patterns can move at varying speeds and continue through linked units. The DYNAMO enables direct DMX input for professional programming and control of vibrant color patterns and dynamic visual effects. Through mere change of the internal control module, The DYNAMO morphs into Dynamo Pixel which puts out video displays via dedicated PC interface. DYNAMO contains a row of 48 pixels throughout the length of 1 meter. The DYNAMO uses 6 DMX channels to exploit the maximum out of the tube creating unbelievable effects! Control: DMX512 in DMX mode or dedicated PC for Pixel. Color change: RGB color mixing, solid state, no motors!